(Reuters) - Former U.S. President George H.W. Bush has been moved to an intensive-care unit at a Houston hospital with pneumonia and was stable and resting comfortably after doctors performed a procedure to clear his airway, his office said on Wednesday. His wife of 72 years, former first lady Barbara Bush, also was admitted to the same hospital on Wednesday as a precaution after experiencing fatigue and coughing, the office said in a statement. 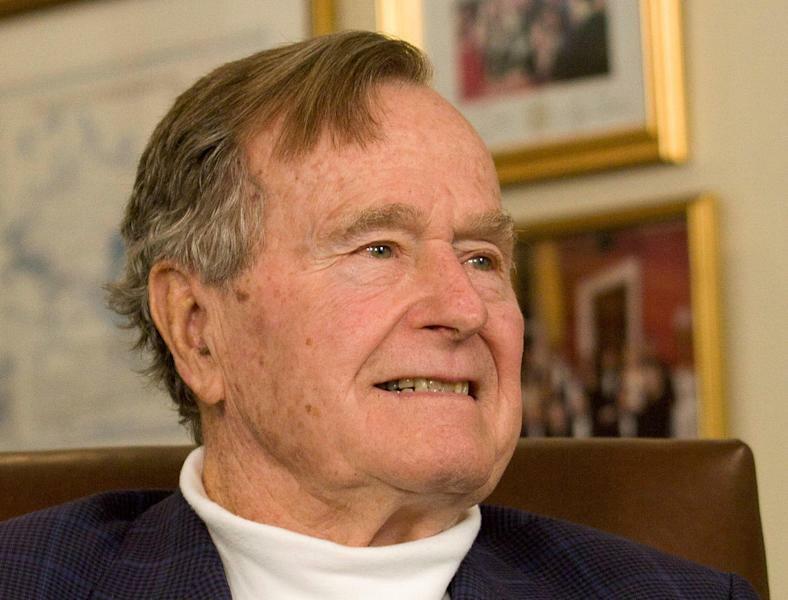 Bush, who at 92 is the nation's oldest living ex-president, has been at Houston Methodist Hospital since Saturday after experiencing shortness of breath, family spokesman Jim McGrath said on Wednesday. He will remain in the hospital's intensive-care unit for observation, his office said. Bush and the 91-year-old former first lady marked their 72nd anniversary on Jan. 6. At a White House news conference, President Barack Obama said that the Bushes have been a constant source of friendship and good counsel to him and to first lady Michelle Obama. "They are as fine a couple as we know, and so we want to send our prayers and our love to them," Obama said. The eldest Bush, a Republican like his sons, was vice president during Ronald Reagan's two White House terms before being elected president in 1988. He lost his re-election bid to Bill Clinton, then the Democratic governor of Arkansas, in 1992. A naval pilot during World War Two, Bush became an occasional skydiver after leaving the presidency and marked his 90th birthday by parachuting from a helicopter with jump partner. He has used a wheelchair in recent years and was hospitalized twice in 2014, once for seven weeks with pneumonia and again for breathing difficulties. In July 2015, he broke a bone in his neck in a fall at the family home in Maine. Bush and his wife were already planning to miss President-elect Donald Trump's inauguration on Friday due to health reasons. "My doctor says if I sit outside in January, it likely will put me six feet under," Bush wrote to Trump on Jan. 10, according to a copy of the letter released on Wednesday. "Same for Barbara. So I guess we're stuck in Texas." Trump was critical of George W. and Jeb during the 2016 presidential campaign, and their father did not endorse Trump in his race against Democrat Hillary Clinton. But in his letter, Bush said he and his wife would be with Trump in spirit at the inauguration and wished him "the very best as you begin this incredible journey of leading our great country." Republican Senator John McCain and the Carter Center, founded by former President Jimmy Carter, posted tweets wishing Bush a quick recovery. In December Bush marked the 75th commemoration of Japan's attack on Pearl Harbor by attending a ceremony at his library at Texas A&M University.